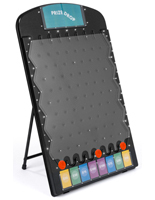 Do you need a truly distinctive way to get attention from passersby at exhibitions, conventions, and many other events? 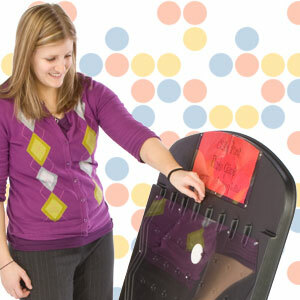 These trade show games bring a unique and fun element wherever they're being used. Attractions like these are familiar to most people, having been seen and enjoyed on television screens for years. 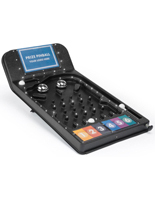 These portable prize drop kits bring that same sense of entertainment to potential customers and visitors alike. This helps make anyone more accessible to passersby, leading them to spend more time at a booth listening to company info as they play. 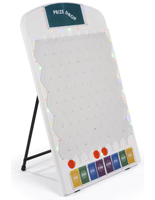 Trade show games of chance, also known as disc boards, can be used for more than just advertising promotions. 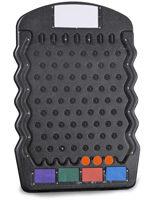 They also work as tools that can educate and entertain all at the same time. With their longstanding construction, these fixtures will last for years, surviving trips to many different places and events. 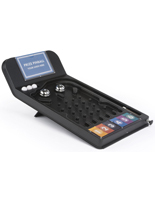 These trade show games are in stock and ready to ship today! What do you receive when you order one of these kits? 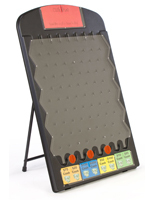 With these trade show games of chance, the dice board is the most important component. 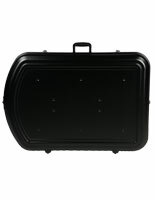 Each one is crafted from a longstanding and hard-wearing ABS plastic. The fixtures are available in tabletop sizes for smaller locations, as well as full floor standing sizes that are large enough for kids and adults. Each unit has sixty-eight (68) pegs lined up in an offset pattern. 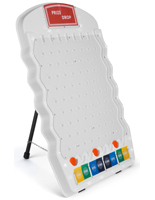 A powder coated steel stand is also included. This support helps to provide a sturdy and stable base for busy and high traffic areas. 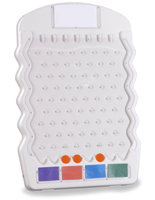 Also included are (3) game chips that create a distinctive 'plink' noise as they fall down. Alternatively, models with dice are also available. A clear acrylic overlay for keeping pieces in the frame during play. 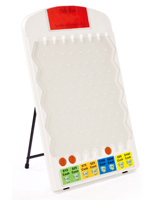 Each portable prize drop board arrives blank with slots for custom signage. This personalization allows you to create a unique display that can be specially tailored to any occasion. Art templates are available for download on our website, which can help anyone create custom designs to meet any need. Playing is even easier! Simply drop the flat circle at the top of the pegged area, and watch as it slides. The piece should them ricochet off of the installed pegs, making that noticeable 'plink' noise as it moves. The circle will come to a stop in one of the eight (8) slots at the bottom, with labels that can indicate what they've won. Alternatively, dice can be dropped and the result can correspond to a certain award. What sort of events can these portable prize drop kits be spotted at? Conferences are great for dice games that lure people over with the chance to win awards. Company promotional materials can be worked into the custom graphics, creating a subtle form of advertisement that helps customers associate companies with excitement. These stands are a great way to reward customers for filling out a survey or questionnaire, especially if winnings are involved. They also make an ideal attraction in corporate culture, whether it's directly in the office or at a special event. Each unit gives companies an entertaining and fun way to impart incentives to their staff, as well as encourage them to strive for more. Incorporating portable attractions like these into classroom learning is a great way to keep kids interested, and allows them to associate something fun with a topic that may not have held their interest in the past. 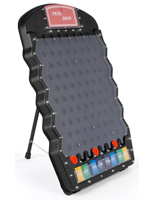 Bringing in one of these stands is a great way to encourage donations at fundraisers, giving people the opportunity to have fun for a good cause. Prize drop fixtures like these will attract attention and incentivize customers, students and employees in any environment. With the chance to win awards, people will line up to learn more about any company!